The resentment that explains rural white political identity sits in tension with both grace and truth. 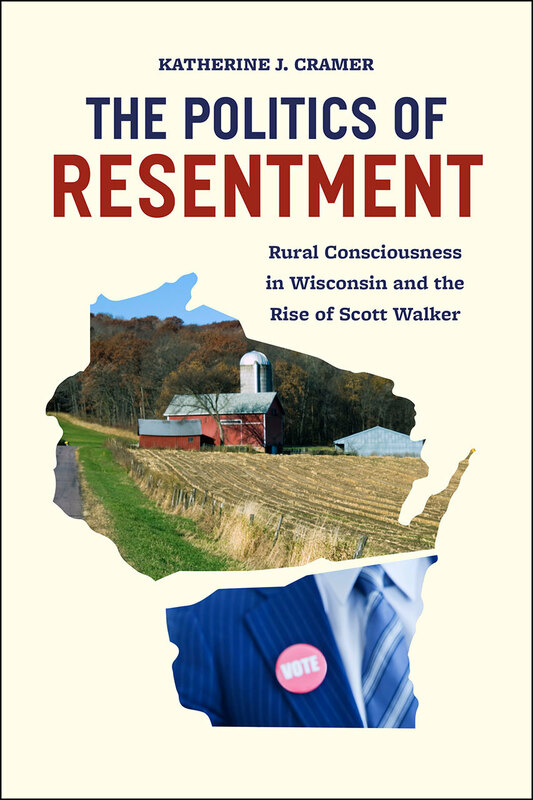 The Politics of Resentment: Rural Consciousness and the Rise of Scott WalkerUniversity of Chicago Press, 2016. 256 pp. Perhaps William Munny had it all wrong. A quarter century ago in the film Unforgiven, the assassin Munny (played by Clint Eastwood) stands over Bill Dagget (Gene Hackman)—about to administer yet another kill shot in a long career of life-ending blasts. Dagget, already wounded and his fate sealed, claims: "I don't deserve this—to die like this. I was building a house." Munny responds with what would become one of the classic lines of American cinema: "Deserve's got nothing to do with it." It would seem that early in the twenty-first century, millions of rural white Americans would vehemently disagree with Munny. In fact, the unifying theme of three 2016 books written by authors from disparate disciplinary orientations (law, sociology, and political science) about distinct places (Ohio, Louisiana, and Wisconsin) settles on the sentiment of "deservingness." All three authors arrive at the conclusion that much of rural white conservative political identity simmers with resentment that hard-working people like them play by the rules but fail to get what they deserve—all while the government conspires to benefit those who are more interested in handouts. 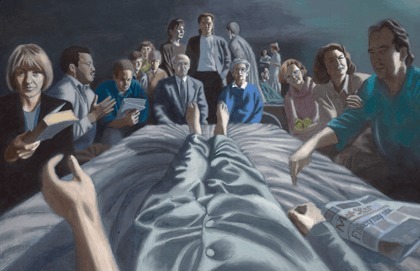 Within the politics of resentment an insidious mutation occurs where differences in political points of view on both sides are interpreted as "fundamental differences in who we are as human beings." Mamaw listened intently to my experiences at Dillman's. We began to view much of our fellow working class with mistrust. Most of us were struggling to get by, but we made do, worked hard, and hoped for a better life. But a large minority was content to live off the dole. Every two weeks, I'd get a small paycheck and notice the line where federal and state income taxes were deducted from my wages. At least as often, our drug-addict neighbor would buy T-bone steaks, which I was too poor to buy for myself but was forced by Uncle Sam to buy for someone else. That visceral sense of impropriety in the federal government's alliance with the undeserving is also considered through more disciplined analyses in sociologist Arlie Russell Hochschild's Strangers in Their Own Land: Anger and Mourning on the American Right and political scientist Katherine Cramer's The Politics of Resentment: Rural Consciousness and the Rise of Scott Walker. Focusing on the polarization of the US electorate, the two volumes set the scene for Donald Trump's November 2016 victory. The resentment and mourning that these two authors independently identify in Wisconsin and then one thousand miles south in Louisiana converge in the notion that some "other" has an unfair advantage because of governmental interference—an "establishment" that picks favourites. Because of that antagonism, the disaffected subjects of the two books find deep resonance with candidates who frame themselves as anti-establishment. Cramer explores the alienation and hostility in the rolling hills of Wisconsin through the lens of "rural consciousness": the sense of resentment among those in rural areas that they have been ignored and abandoned by their urban counterparts and by the government. Hochschild explores the swampy terrain of Louisiana bayous where she encounters the "Great Paradox": the phenomenon of people who would benefit from government regulation actually agitating against it. In an attempt to better understand contemporary hostility and alienation based on political identity, both Cramer and Hochschild engage in modified ethnographies, immersing themselves in various social settings and then pursuing richer evidence in focus groups and in-depth interviews. Cramer describes her task as less about indicting average voters and more about illuminating how "we blame each other" and "what it looks like in practice when people interpret politics by focusing on whom they are against and whom they resent." Cramer also articulates her fear that within the politics of resentment an insidious mutation occurs where differences in political points of view on both sides are interpreted as "fundamental differences in who we are as human beings." Hochschild, concerned about the same estrangement, describes the growth of what she calls "empathy walls": those obstacles that prevent understanding another person and "make us feel indifferent or even hostile to those who hold different beliefs or whose childhood is rooted in different circumstances." Embedding herself in rural Louisiana, Hochschild intentionally distances herself from her affirmation enclave in Berkeley in an attempt to scale her own empathy walls. Over the last six decades the population density of a county has become a strong predictor of how the citizens there will vote in a presidential election. At root, both Cramer and Hochschild set out to clarify the societal sorting where progressives and conservatives cluster into politically toned enclaves. Without consistent interaction, empathy walls emerge and become concretized with hostility and reliance on quick assumptions that filter news and evidence through pre-existing explanatory screens. For evidence of the deepening divide, Hochschild notes that in 1960 no more than 5 percent of American adults indicated that they would be disturbed if they had a child who married a member of the "other political party." In 2010, though, 33 percent of Democrats and 40 percent of Republicans reported that they would be distressed in such a marital scenario. Hochschild identifies this trend as "partyism." According to Cramer, "the rift is, on its most basic level, a rural-versus-urban divide." The November 2016 election offered stark evidence of Cramer's argument as Donald Trump fared poorly with urban voters only to be matched by Hillary Clinton's miserable results among the rural electorate. Indeed, while Clinton received over 55 percent of the vote in metropolitan areas with populations more than one million, Trump's share of the vote in rural, non-metropolitan areas began at 58 percent and rose to over 70 percent as the areas became less and less densely populated. In fact, over the last six decades the population density of a county has become a strong predictor of how the citizens there will vote in a presidential election: higher-density counties lean Democratic while lower-density counties lean Republican. After spending time in Louisiana, Hochschild posits that the members of the Tea Party there have embraced something she labels as the Great Paradox. That is, even after they have been socially, economically, and in some cases medically devastated by the ravages of environmental rapaciousness by corporations, the rural whites in her study still agitate against governmental regulations designed to protect citizens and natural resources. Similar to rural consciousness, the Great Paradox includes a nemesis. The locus of the antagonist includes any facilities where welfare offices distributed resources to beneficiaries: Louisiana Head Start, Louisiana Family Independence Temporary Assistance Program, Medicaid, and the Supplemental Nutritional Program for Women, Infants, and Children—to name a few. After all, these places operate as sites where the shiftless receive their unmerited push ahead. With their government conspiring to help those who deserve it the least, the rural Tea Party members see themselves as a besieged minority. A new identity emerges as those who feel that they have been betrayed by their own government coalesce around the feeling of being strangers in their own land. 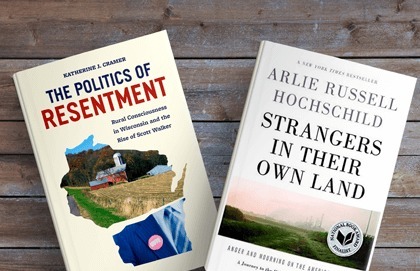 While Hochschild depicts a sense of estrangement, Cramer insists in her Wisconsin study that contemporary identities are rooted in place: for some voters, their rural lifestyle orients their identity. 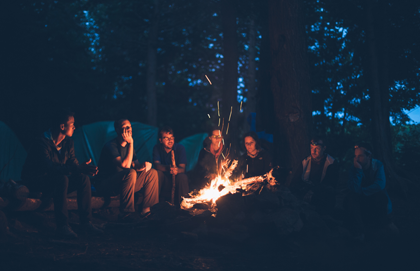 In five years of research, Cramer invited herself into an array of regular social gatherings across the span of Wisconsin. The locations included greasy spoon diners, church basements, and gas stations—basically any spot where a group of locals gathered regularly for food and conversation. At one point, though, she found herself on a dairy barn walkway as a farmer voiced his support for Governor Scott Walker's efforts to reduce collective bargaining and overall salary and benefits for state employees: "A man working with the milking machines looks around the back of the cow at me and says, 'I'm glad Walker did what he did. It's about time someone takes something away from those bastards." In that remark, we see the essence of rural consciousness—the sense that cities and government have a virulent disregard for those who inhabit rural areas. The groups with whom Cramer regularly met articulated their perception that decision makers routinely ignore rural places. Moreover, when designating the distribution of resources, the government consistently fails to give rural areas their fair share. Finally, rural consciousness includes a sense that rural folks have fundamentally unique lifestyles, values, and work ethic that establishes an identity in opposition to urbanites. Rural consciousness casts urbanites, racial minorities, regulatory bodies, government employees, and even teachers as an amorphous rogues' gallery. Similarly, the Tea Partiers from Louisiana caught in the Great Paradox consistently moved conversations toward the rift they identified "between deserving taxpayers and undeserving tax money takers, those in a class below them." The Wisconsinites in Cramer's study expressed displeasure with "big government" because of their perception that it did not function on their behalf. Similarly, in Louisiana, Hochschild reports that her new acquaintances reveal a sense that the government allies itself with "line-cutters": not only does the government not do anything for them personally, it intentionally conspires with the less-deserving to leapfrog all the folks who have worked hard and played by the rules. The passion for less government actually had limited relationship to the perceived faults in regulation and oversight themselves. Rather, the concern found focus on the overcompensated government employees and the recipients of government largesse. In fact, when Hochschild asked her interviewees for their assessment of how much of the US workforce was employed by the federal government, they commonly estimated 40 percent. The actual number has been in decline for over a decade and stands at less than 2 percent. In Wisconsin, Cramer found a similar concern regarding state employees. Because they have the taint of government association, teachers, game wardens, and public employees all are typically deemed as not "truly rural." In fact, that guilt by association prompts the perception that public employees be understood as slothful and undeserving. Based on her visits to gas stations, cafés, and church basements in Wisconsin, Cramer ultimately claims that voting has less to do with issues like the economy than it does identity. In an echo of that finding, Hochschild notes that in her visits to Trump campaign rallies she witnessed a collective effervescence (a word often used by sociologists to describe congregational worship experiences) that centred on "the profound importance of emotional self-interest—a giddy release from the feeling of being a stranger in one's own land." A new identity emerges as those who feel that they have been betrayed by their own government coalesce around the feeling of being strangers in their own land. In both rural consciousness and the Great Paradox those who have achieved the American Dream by gaining substantial wealth have little to no culpability. Cramer discusses the fact that within rural consciousness, the identified "demons" are not affluent people, but the government. Similarly, Hochschild's informants identify "up." That is, they admire those who have made it while they disdain the listless and idle who collect government cheques. Moreover, since the government has allied itself with the line-cutters, the rural whites in Louisiana feel compelled to align with the free market, the ally of the hard workers. When liberals suggest they direct their indignation at the ill-gotten gains of the wealthy, they shrug. What About Race and . . . Grace? While Cramer and Hochschild have explained some reasons for political polarization, further work also remains in terms of deepening our understanding regarding the role of race and religion in the communities studied by these authors. First, it could be argued that race functions as the subtext of both rural consciousness and the Great Paradox. While Cramer briefly addresses the racial component that exists within the rural consciousness, she resists utilizing racism as an explanation or underpinning. In discussing that decision, she cites thin evidence: that her interview transcripts failed to reveal any instances where a rural resident directly linked urbanites with being lazy welfare recipients and because she observed little overt racism in rural Wisconsin. Yet we know that in a racialized society, covert and implicit forms of racism continue to have profound significance. Hochschild similarly notes a savviness or restraint in discussing race among her interviewees: "Enormous care was given to speak delicately and indirectly about blacks." However, she also reports that her interviewees had rather narrow definitions of racists: those who used the N-word or expressed hatred toward African Americans. Moreover, she discusses the fact that her older right-wing whites only knew African Americans through television screens and newspapers—not as neighbours or colleagues. Because of that social distance, African Americans never appeared as a person "standing patiently in line next to them waiting for a well-deserved reward" in the minds of Hochschild's Tea Party members. If anything, these studies demonstrate the necessity for renewed attention on the insidious ways in which racialization continues to matter—even in almost exclusively homogeneous communities and subcultures. 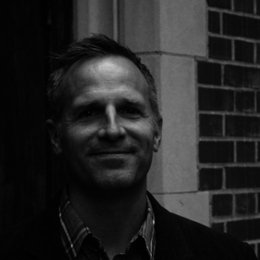 Second, how does faith figure into rural consciousness and the Great Paradox? While Hochschild attends Pentecostal church services during her research and posits that a perceived curtailment of religious liberty catalyzes at least a component of the Tea Party, Cramer ignores the faith of her interviewees almost entirely. Another story from Hillbilly Elegy illuminates the possibly convoluted role of religion in these same rural, largely white communities. Vance first notes that the churches where he grew up did not have the resources or capacities to offer much in terms of social support or aid. Later he offers a real head-scratcher about the role of churches in his family: he claims that the Christian faith "stood at the center of [their] lives," but that the family never attended church, except on the rare occasions when "Mom decided that what we needed in our lives was religion." Such an example raises questions about whether faith communities feed or mitigate rural consciousness and the Great Paradox. These studies demonstrate the necessity for renewed attention on the insidious ways in which racialization continues to matter--even in almost exclusively homogeneous communities and subcultures. With this in mind, further work on alienation and partisanship needs to insist on including religion as a variable of significance. Based on 2016 reports from the Pew Research Center, almost half of the Wisconsinites interviewed by Cramer would have considered themselves "highly religious." And Wisconsin's steepled rural main streets attest to the cultural influence of Lutheran and Catholic churches. Moreover, Louisiana ranks as the fourth most religious state in the union (a whopping 71 percent report being "highly religious"). With such a preponderance of attachment to the Christian faith in these two disparate states, one cannot help but wonder about the incongruence and tension of a theology of grace and abundance vibrating against a politics of deservingness and resentment. In the end, the spectres of nostalgia and desperateness shadow all three books. As the American Dream becomes ever more elusive, memories of its previous availability only heighten the frustration. Downward mobility and declining economic opportunities push citizens to cast about for a solution in oppositional political identities. Perhaps most disconcerting, resentment and deservingness do little to promote justice for all.